Luffa is a member of the Cucurbitaceae family, other members of which include melons, gourds and squash. Its is an annual, fast growing tropical-semitropical vine that produces edible fruits while immature, and awesome scrubbies when matured. Their native range spreads from Africa to Asia, though the plant likely originated in India. Luffa seeds of the luffa plant have been found in both Roman and Egyptian archaeology sites, and it has been used industrially as recently as WWII for use in surgical operations, as a filter in the Navy’s steam and diesel engines, as cushioning in vehicle and tank seats and because of its insulating properties, in Army helmet linings. The vine can get more than 30 ft (9 m) long and scrambles over anything in its path. The large leaves are lobed and have silvery patches on the topsides. The flowers are about 2-3 in (5-7.6 cm) across with five petals. Male flowers are bright yellow and occur in clusters while female flowers are with the ovary attached. The fruits are green, and depending on the variety grown can vary from zucchini-like, to the size of a large lime. While the vine is quick growing, the fruits requires a long growing season to reach maturity. It takes about three or four months until the fruits can be harvested for eating, and about four or five for harvesting of the mature plant. If you don’t have that much warm weather, the seeds can be propagated indoors in peat pots and then transplanted (the peat pot is important, as plants in the squash family dislike transplanting). The plant requires full sun, and should be planted outdoors well after danger of frost. Additionally, to speed up germination, try soaking the seeds in water overnight before sowing. My family would always sprout our seeds by wrapping them in moist paper towels for about 3-4 days and placing them in a warm area with diffused sunlight. It was the one event that meant spring was coming. Long after my grandfather was not able to have his huge garden anymore he would still sprout the luffa seed and give them to our neighbors or to more distant members of our family. He always said it was habit to do it every year but I think secretly he continued to do it so that he could watch the faces of the youngest members of our family as we slowly pulled back the paper towels to discover the newly sprouted plants. After the seeds had sprouted, we would then transfer them to a biodegradable seed pot (such as Jiffy Peat Pots or the do it yourself newspaper kind) so as to not disturb the root structure when transplanting. By using this method of seed starting we were able to maximize our seeds by not having to thin out any. After placing one sprouted seed per peat pot, we then sprinkled with a potting mixture just enough to cover the seed and to let the sprout show through. After 2-3 true leaves developed it was time to put them into the ground. When figuring out where to plant the Luffa, take into consideration that it is a fast growing vine that can reach around 30 feet in length (so you might want to pinch the ends to encourage a more bushy plant) , and that the plants can get fairly heavy. A trellis or other support structure is highly recommended. It is recommended that the Luffa recieves similar maintenace in terms of insects, watering fertalizers, etc as squash and gourd plants. The luffa is insect pollinated (for all you bee keepers, I have read that bees love luffa and that luffa honey is yummy). It is also possible to hand-pollinate, particularly if you are growing indoors, by transferring pollen from the male flower to the female flower. Seeds should be saved from the earliest fruits reaching maturity with the best fiber, if you are planning to grow them for scrubbies. I’ve also read that the smaller varieties can be grown indoors for the full season with some difficulty (but the site with indoor growing tips is no longer available). The fruit should be harvested at maturity, when the fruit looses its green color (most will turn brown) and the seeds will rattle when it is shaken. The fruit can be cut from the vine and the skin peeled, and seeds removed. • Make a shallow cut down the length of the shell immediately after harvest, and peel. • Dry gourds before attempting to remove shell. • Cut 1/2 inch off the bottom of the gourd and allow the inside to dry completely. • Drop the dried gourds on a hard surface to shatter the outer shell. • Soak luffa in warm water for a few hours, boil in a pot of water for 15 minutes, or heat in a microwave for a few minutes, to soften shell for easy peeling. • Freeze gourds for a few hours, thaw, then peel. Once the spongy part of the loofah is removed, it can be washed. It can also be lightened with a bleach or hydrogen peroxide and water solution, if you prefer. Loofahs should dry out completely between uses to prevent bacterial growth. They can last for months with regular use, for both bath and household use. 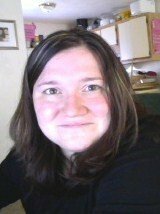 For more info, with pictures, click here! The luffa’s immature fruits from 3-6 in (7.6-15 cm) in length, can be stir-fried whole or sliced, or they can be grated or diced and used in soups and omelets. Larger fruits that are 4-6 in (10-15 cm) in length might need to be peeled because the skin becomes bitter as the fruit matures. Some luffa varieties may produce fruits that are too bitter to eat. Peeling the skin off removes some of the bitterness. If it tastes bad, don’t eat it. The half dozen varieties we’ve grown have all tasted good to us. 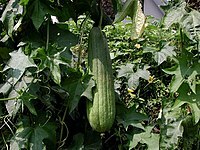 Edible luffa can be found sometimes in markets with Asian style vegetables. We like them sliced in a stir fry or just sauteed in a little olive oil. Seasoning with a dash of soy sauce and cayenne pepper makes a tasty appetizer. The flowers have a green flavor similar to celery or cucumber. They make a colorful salad. The edible size fruits taste something like a cross between a zucchini and a cucumber. To make the dinnertime treat, cut 2 sixinch gourds lengthwise, scoop out their middles, and parboil or steam the shells for 3-4 minutes. Meanwhile, chop and lightly sauté 1 clove of garlic, 1 onion, and 1/4 pound of mushrooms. Add 2 cups of cooked rice, 1/4 cup of pecans, and some crumbled cooked bacon (optional) to the mixture. Then, season the filling with thyme and tarragon, stuff it into the luffa cavities, sprinkle Parmesan cheese and wheat germ over the top, and bake the “boats” for 25 to 30 minutes at 350°F. Mmmmm! Sliced loofah or loofah powder can be used in soap making! Thank you for share.I like to eat Luffa.